This DS game is great! You choose a breed of horses and create their color and markings. You can take your horses on trials and solve problems and quests, find wild ponies and tame them. And you can also care for your horses. I have played with this game several times and give each and everyone of my horses their own names. 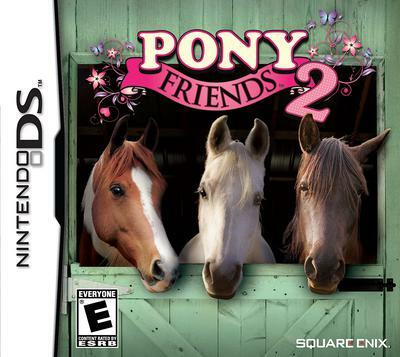 I've been thinking... if I ever have a chance to play with the game on my Nintendo DS, I'll probably give them names such as: Pegasus, Unicorn, Alicorn, Littlefoot, Cera, Ducky, Petrie, Spike, Chomper, Ruby, Optimus, and Ironhide. When my mom gave me the game from Wal-Mart, and I started playing with it for the first time, I looked at the different landscapes and the wildlife that you see on the trail ride such as the large seagulls, the fallow deer, and the desert tortoise. I had a feeling it took place in either Alberta or British Columbia since they are close to each other. This game is good. I play in 12 owners and in all i had 3 horses. This is a special game for people who loves horses. I'd started riding in club OJK Pegaz. There are lost of horses. This game is the best. You can ride, clean and do lots of things. I am from Polish but I was born in USA. My friend bought me this game. I love this game, horses and friends in the stable. Thanks to this people who made that game. I love this game, it's the best horse game i have! The best game I have had!!!!!!!!!!! I got mine at best buy.